Euro NCAP 5 stars passenger protection, 3 stars child passenger protection, 2 stars pedestrian protection. On post 2012 facelift C-Class the COMAND satnav accepts seven figure postcodes. Service indicator can be re-set using a sequence incolving the column stalks. Video available on You Tube. The original Comand system satnav did not take a full UK postcodes. Complaint of noisy electric folding mirrors. Criticism of the brightness of the instrument display on the 2012 facelift model. Serious issues with piezo injectors of 220 CDI cracking in later 2009. Many cars off the road for extended periods. Supply problems of replacement injectors, apparently made in Malaysia. 4-2-2011: Seems to be a widespread problem with automatic transmissions. Mercedes-Benz is instructing dealers to replace the transmission valve control body, but there is a shortage of parts. 2-3-2011: Battery drains over about 2 weeks seems to be a problem. 27-8-2011: Problem of premature wear of timing chain sprocket for balancer shaft of M272 and M273 V6 petrol engines. Mercedes-Benz Star bulletin about this. Big job. Can cost £4,000. 20-5-2012: Several reports of brown stains appearing on alloy wheels of C-Class at 2 - 3 years old. 22-5-2012: Paint problem after four years on front and rear bumpers of solid red painted examples. 23-5-2012: Yet another complaint of corroded alloys. Could be that rusting of the steel wheel bolts is what causes the brown stains. Corroded wheel bolts is quite an old complaint, previously not thought significant enough to record. 16-7-2012: C350 has propensity to blow 477 H7 dipped beam bulbs. 7-9-2012: J ust after the three year warranty had expired, the steering column of a 2008 C220 CDI had to be removed for worn or faulty 'bushes' to be replaced. MB met 95% of the £700 cost, most of which was labour. Automatic tranmission recently began sticking in 3rd gear and juddering or lurching at low speed. Repaired at a cost of £396. 14-9-2012: Strange problem of indicators flashing the wrong side. Might be due to moisture ingress to one of the side repeaters. 19-4-2013: Uresolved dashboard rattle irritating some owners. Apparently Mercedes is aware and is developing a kit to fix it. 31-10-2013: Sticking gearchange on three year old C250 BlueEfficiency CGI estate automatic turned out to be the torque converter, which was replaced under warranty. 2-12-2013: Report of MoT Advisory for rusting brake pipes on 45k mile November 2007/57 C220 CDI. 13-12-2013: Plastic interior door handles of W204 and S204 C Class seem to be breaking regularly. The first to fail is the drivers because it is the most used. Because these are an integral part of the door panel and not available separately, the cost to replace is £374 (inc VAT), plus fitting. Up to 75% is offered in 'Goodwill' in Germany. Nothing so far in the UK. 13-12-2013: Plastic interior door handles of W204 C Class seem to be breaking regularly. The first to fail is the drivers because it is the most used. Because these are an integral part of the door panel and not available separately, the cost to replace is £374 (inc VAT), plus fitting. Up to 75% is offered in 'Goodwill' in Germany. Nothing so far in the UK. 29-12-2013: Glycol contamination of automatic transmission fluid via the transmission heat exchanger can still sometimes occur, necessitatiing a new radiator and heat exchanger and flushing out and changing of ATF. 30-4-2014: Rusted brake pipes reported on 2007 Mercedes W204 C320, replaced at 45k miles, then at 66k miles paint on rear wheelarches flaked off and surface corrosion set in (see photo). 26-8-2014: Another injector failure reported on 2011 S204 Mercedes C220 CDI Blue Efficiency. 31-8-2014: Oil pump failure reported on 126k mile 2007 Mercedes C220 CDI. 31-10-2014: On Mercedes C220 CDi Sport Blue Efficiency, engine "locked up" at 28,000 miles, 3 months out of warranty. Had previously needed replacement piezo injectors, but because it has been serviced by an independent, MB denied any responsibility. 20-11-2014: Another complaint of Mercedes W204 C Class interior door handles breaking and the whole door panel having to be replaced. This reader was quoted £500, so the cost has gone up. 17-1-2015: Steering lock of 4 year old C-Class estate failed costing £1,000 to rectify. 13-2-2015: Jerks from 7G automatic transmission in C-Class less than 3 years old were not cured by a dealer software update. An automatic transmission fluid change did cure the problem, but the dealer tried to charge for it. 14-3-2015: Another case of rusting rear brake pipes on a 6 year old Mercedes Benx C220CDI (see 2-12-2013). 8-4-2015: CD changer of Command system of 2011 W204 C-Class failed. Quoted £475 to fix, or £1,900 if the owner had damaged it himself somehow. 7-5-2015: Report of automatic transmission problem on 2013/62 Mercedes C-Class 1.6 petrol estate. On occasion it fails to change gear, normally at the start of a journey. The problem is intermittent. MB dealer failed on three separate occasions to find the fault, let alone diagnose its cause. 14-5-2015: 18" wheels with 225/40 tyres on the front and 255/35 on the rear reported as particularly prone to pothole damage on an S204 C250 estate. 21-5-2015: Report of failed steering rack on 27k mile 5 year old Mercededs C200CDI. Estimate for replacement £2,000. 2-6-2015: Report of failed steering lock on 38k mile 2011 Mercedes C220. Cost £520.80 to replace. 3-6-2015: Complaint of 'Artico' seat material of driver's and front passenger's seats of 52k mile 2008/58 Mercedes C180 tearing along the main seams. Driver a normal 12 stones in weight, wife a lot less. 5-8-2015: Complaint of premature stretching of timing chain in engine of 42k mile 2010 C180, not cured by replacing the tensioner and giving it an oil change. 19-9-2015: Oil leak from timing chain tensioner seal of 109k mile Mercedes C220CDI W204 resulted in needing new valves, valve springs, lifters, etc. Correspondingly, the turbo bearing was found to be worn and a new turbo was needed. Total cost £4,400. 25-5-2016: Cooling system problems reportd on 2012 Mercedes C250CDI at 32k miles: Two coolant leaks on the engine: Water pump and Thermostat housing. MB offered 50% goodwill towards the waterpump, but total cost of replacements will still be £550. 4-6-2016: On some models of W204 with keyless start the only key is for the glove locker, but if this gets broken into a new lid is £550 and there may be problems coding a key to the lock. Aftermarket lids are not lockable. 1-7-2016: Timing chain imminent failure reported on 2010 Mercedes C180 auto estate when with dealer for 50k mile service. Cost estimated about £2,000. Possibil;ity of a 25% - 75% contribution from Mercedes. 9-8-2016: 'Tinkling' reported from timing chain area of 40k mile 2007 Mercedes Benz C200CDI on start up. Probably timing chain tensioner not getting enough oil. 29-10-2016: Report of engine of 2012 C63AMG needing replacement of all 4 camshafts, cam followers and tappet adjusters at a cost of £8,000. Engineer owner thinks that as all 4 cams have failed together there is an oil supply problem (unlikely) or incompatibility between the cams and cam followers or perhaps poor cam lobe hardening. Goodwill claim been made but the offer of a contribution by MB (20%) and the dealer (2.5%) left owner to pay £6366. 29-11-2016: Report that 45k mile 2010 Mercedes-Benz C180 CGI estate requires software update and replacement of timing chain and tensioners at a cost of £3,000. 6-5-2017: Report that the unit that receives the remote/transponder on the steering column to start a 2012 Mercedes C180 has had a horrid crunchy action from new making it awkward to remove. After 5 years it's getting worse. 1-8-2017: Another report of a failed steering lock on a Mercedes-Benz W204 C-Class. Owner billed £700 for replacement. 3-8-2017: Further report of interior door handle breaking, this time on a 2010 W204 Mercedes M=benz C Class. Owner quoted €545.53, plus fitting, by a Mercedes dealer in France; then £434.40 inv VAT plus fitting by a Mercedes dealer in the UK. MB refused to contribute in any way. 17-10-2017: Report of r evs fluctuating when cold making 2012 MB W204 C220i auto impossible to drive. When engine is warm its ok. Likely to be camshaft adjustor failure, symptoms of which are: a rattling noise on start-up, uneven running and a rough idle, diagnostic trouble coded related to camshaft timing. 12-11-2017: Report of power steering becoming stiff on 2012 Mercedes Benz C180 becoming very stiff in autumn 2016. Garage identified problem as battery being low on charge and battery was replaced. Then in October 2017 the same thing happened. Again the steering appeared to 'lock up' on turning, but assistance returned when straightened up. Again garage found that the charge in the battery was low and it was replaced for a second time, just one year after the first replacement. Car is driven less than 3,000 miles annually so owner has now bought a Smart AGM battery charger to keep the battery charged. 15-1-2018: Report of problem with 7-speed torque converter auto in 2007 Mercedes-Benz C-Class 2.5 C230 Auto Avantgarde SE Estate at 108k miles. The gearbox had performed faultlessly for years, until October 2017. All manner of problems suddenly appeared, in intermittent fashion. Eventually, a knowledgeable expert diagnosed a faulty speed sensor located inside the box. Apparently the normal operating temperature can be a factor in degradation and failure of these components. The whole gearbox electronic control unit was removed, sent to another expert (for replacement of the faulty sensor) and then refitted along with a general g/box service at a cost of £750. The g/box performance is back to silky smooth. Owner told this is a 'common' fault. 4-2-2018: Report of 2009/59 Mercedes-Benz C180 CGI, bought new from a Mercedes main dealer and serviced throughout by them. At the last service they advised owner that there was an oil leak. They quoted for repair as follows: 1. Oil Filter Housing Cracked £987.24; 2. Engine Sump Leaking £646.68; Then they say the following too may be required after the above work is done: 1. Turbo Return Line Leaking Oil £663.18; 2. Turbo Intake Pipe Leaking oil £131.04; 3. Rear Main Oil Seal Leaking £818.28. The car has only done 34,000 miles. 4-2-2018: Report of starter motor failing on 2013 Mercedes C220 at 20,500 miles. Owner had to wait 6 days to get the car into Mercedes then a further 5 days for the dealer to get the parts from Germany. Mercedes Southampton agreed that the starter motor should not have failed but refused to cover the full cost of repair. Owner was charged £350 for the repair. He contacted the Motor Ombudsman in November asking that they help recover the money. It took over 2 months to get a reply that they simply we cannot help because the car was out of warranty. 15-5-2018: Complaint of leather base of driver's seat of 2013 Mercedes-Benz W204 C-Class splitting along the seam. Neither selling dealer not Mercedes Benz interested. See: 3-6-2015, 3-7-2017 and 31-7-2017. 26-6-2018: Report of driver side door lock failing in 2007 Mercedes W204 C220. Won't lock with the fob or the interior lock botton. 10-7-2018: Report of differential failure on 2009 Mercedes Benz C180 1.6 at 75,000 miles. Dealer quoted £2,500 to replace it. 16-7-2018: Report of timing chain failure on 70,000 mile 2011 Mercedes-Benz W204 C180 CGI with full service history. Owner checked with independent garages and they state that at least 2-3 a week are now having these failures on the W271.8 evo engine. 25-7-2018: Report of electromechanical parking brake of 2012 MB S204 C class estate automatic failing to hold the car on a steep incline. Owner has to also put it in Park and then it rolls back a bit. When she then puts it in reverse "it makes a horrible crunching sound." 27-9-2018: Report of steering lock/ignition switch failure on 2008 W204 Mercedes C180. (See 17-1-2015, 2-6-2015, 1-8-2017.) Faulty ignition switch in photo was replaced by Mercedes-Benz of Brighton, for which the labour charge was for 4 hours at £136 per hour (plus VAT). When these steering lock/ignition switches fail, the car is completely immobilised (sometimes very inconveniently) and has to be transported to the nearest Mercedes-Benz garage. Can take a week to get the part frtom Germany. Total cost of repair including recovery in this case was £1,034.40. 21-10-2018: Report of 2013 Mercedes Benz W204 C220 being recalled for airbags to be earthed at Mercedes dealership in 2018 On 10th August it was involved in an RTA "due to the brakes failing" and airbag malfunction. Managed to control the car to a standstill, having 3 collisions in the process (2 cars). The C220 and 1 other since written off. Local Mercedes dealer advised that cer clever enough to know airbags weren't needed at impact 51mph, yet display said airbag malfunction then. MB UK to inspect car w/c 21-10-2018. 8-12-2018: Report concerning December 2012 Merceded-Benz C250 (CDI?) AMG Sport at 46,784 miles. "Engine warning light on fault code p034062 - positioner sensor for intake camshaft has an electrical fault. Suspect camchain stretched/cam gear wear- rattle on start up noticeable." 24-12-2018: Report of offisde track control arm mount of 2008 Mercedes-Benz C350 Sport snapping off the subframe. 3-1-2019: Alarming report of failure of dashboard functions of 2010/60 Mercedes-Benz C250 Blue Efficiency. MB dealer diagnosed a failed media interface unit. Said "spares are no longer available" and owner had to accept the bypassing of the failed unit and consequential loss of satnav, Bluetooth and radio tuning functions. MB Head Office Customer Service also confirmed that no repair/replacement is possible. This is outrageous and contravenes EC law. The part number is A2049008205. The supplying dealer has to supply the part and fix the car. However, the customer could find the cost of this, which he is liable for, to be unacceptable. 22-2-2019: Report of problems with 2013 Mercedes Benz C220 CDI BlueEFFiCiENCY 7G-Tronic three days after an official MB service. Warning lights for: runflat, ABS and EPS appeared. Car drove fine but taken back to MB dealer who replaced front wheel sensors, but that did not cure it so put the old sensors back. Next day diagnosed faulty EPS unit. Replaced that then found a fault on the hydraulic unit that had burned out the EPSt. Have now ordered the part. 3-3-2019: Report of microblistering of the 'Fire Opal' metallic red paint over most of a 2013 Mercedes Benz S204 C-Class estate. Booked in for a respray inder warranty on 24-6-2019, but MB will not repaint an area previously damage repaired. 61 Dated Reports of faults since January 2011. 13-10-2010: MB is recalling around 85,000 Mercedes Benz C- and E-class models in the US to fix a problem with power steering systems, the US traffic authority NHTSA said. MB told Agence France Presse that the recall is likely to be extended to other countries. The NHTSA added that a problem with the steering system's pump could lead to a loss of fluid leading to a loss of power assistance when parking. Daimler stressed that drivers retained control of the car even in the event of a power steering failure. 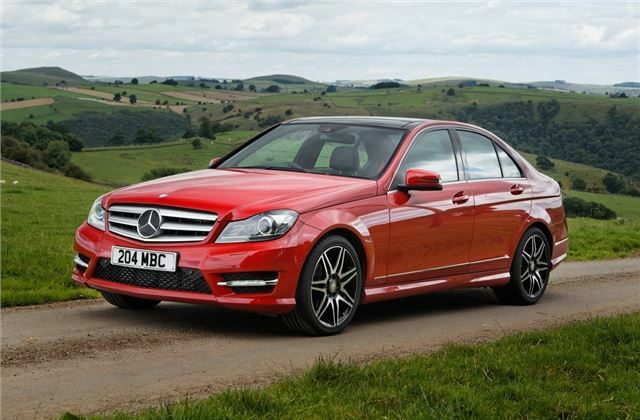 MB said it will fix the problem in 2010 and 2011 models this month by re-tightening a faulty fitting. 1-3-2012. Alerted to Urgent Safety Recall for Mercedes Benz diesels. This relates to a possible diesel fuel leak which may develop at the fuel filter assembly. The dealer will replace the fuel filter. 21-1-2014: Heard of TSB to replace the Piezo electric injectors of 2.1 litre 250CDIs if customers complain of engine malfunction light coming on. Goes back to at least 2010 W204 C-Class. 30-4-2014: Just-Auto reports that Mercedes-Benz USA, is recalling 252,867 model year 2008-2011 C300, C300 4Matic, C350, and C63 AMGs built from 26 January 2007, to 13 July 2011. A poor electrical ground connection may result in the dimming or failure of the tail lights. MB USA is notifying owners. Dealers will replace the bulb holders if not previously updated and replace any corroded connectors, free of charge. Parts are not currently available. Owners will be sent an interim notification in June. A second letter will be mailed when parts are available, currently expected to be in August or September. Owners may contact Mercedes. 23-7-2017: MB issued a voluntary recall to apply software upgrades to diesel engines in a bid to cut nitrogen oxide emissions on three million vehicles. All Euro 5 and Euro 6 standard diesel engines registered in Europe between January 2011 and September 2015 are affected. (Only the new two-litre turbodiesel fitted to the latest E-Class saloon and a new V6 turbodiesel in the soon-to-be released S-Class are exempt.) A Mercedes-Benz spokesman said that the “software upgrade” would be carried out by dealerships when customers visited for a service or other maintenance work and would take around an hour to complete. MB “did not expect” the upgrade to have any effect on the performance of Mercedes-Benz vehicles. Many Mercedes-Benz diesel vehicles have already had the update applied after work to apply the changes to compact vehicles and the V-Class MPV got underway in March. It was reported in The Times in July that while Daimler, which manufactures Mercedes-Benz, had not been found to use the same type of software for cheating emissions tests discovered in Volkswagen vehicles in 2015, it is the subject of an investigation by the German authorities into the possible manipulation of exhaust controls in cars with diesel engines. 09-07-2018: Mercedes-Benz recalls more than 10,000 C-Class models built between 2011 and 2017 over concerns that electrical wiring in the steering assembly could be insufficiently grounded. This could lead to warning messages illuminating in the instrument clusture and, in extreme cases, may cause the driver's airbag to deploy.